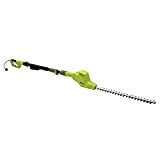 The Earthwise CVPH43018 Corded Pole Hedge Trimmer is the best pole hedge trimmer you can buy for your trimming needs. It’s been a big problem. You’ve grown a wonderful garden that you’re proud of. The fruits, vegetables, and flowers in your garden are the result of your hard work taking care of them. And part of this work has been the trimming of the hedges, shrubs, and bushes in the garden with your garden shears. But it takes a ton of effort to do that. The big problem is those tall hedges and shrubs that you cannot reach. You need to use a ladder and the last time you almost fell from it. No need to get yourself in such a dangerous situation again. Invest in a good pole hedge trimmer and you can trim your shrubs, hedges, and bushes fast and without breaking a sweat. So let’s take a look at the best pole hedge trimmer that will be the right match for your gardening needs. What are the different types of pole hedge trimmers? Do you need a pole hedge trimmer? A hedge trimmer is a gardening tool that helps trim hedges, bushes, and shrubs in the garden fast and with minimal effort. This hedge trimmer can be battery-powered, gas-powered, or electric and each have their pros and cons. When you want to trim hedges that are tall you don’t want to strain yourself on a ladder. That’s where the pole hedge trimmer can help because it comes with a shaft that extends to some feet and makes such trimming a breeze. There are three main types of pole hedge trimmers you can get based on the power used by them. A gas-powered pole hedge trimmer can be quite powerful as it runs on a 2-stroke engine. They can be used for commercial purposes because they can trim several hedges fast before they need a gas refill. And they are quite portable to cover large gardens and landscapes. The drawback of a gas-powered hedge trimmer is that it creates noise due to its powerful engine and pollution due to its exhaust. They need more maintenance compared to an electric pole hedge trimmer. This is because of the gas tank, carburetor, spark plug, air filter, and starter. The corded pole hedge trimmer is an electric type of hedge trimmer that needs to be plugged into a power outlet. They tend to be inexpensive compared to the gas and battery powered pole hedge trimmers. They also create low noise and pollution compared to a gas-powered pole hedge trimmer. Because they don’t have a power source attached to them, the corded pole hedge trimmer is lightweight compared to the gas or battery powered ones. The main drawback of a corded pole hedge trimmer is you need to have a long enough outdoor extension cord that can power it. This also means the range of using the hedge trimmer is limited to this extension cord. The cordless pole hedge trimmer is an electric type that runs on battery. So you don’t need a power outlet to use it. They are low maintenance and lightweight when compared to a gas-powered pole hedge trimmer. But they can be heavier than the corded type because of the battery they need to carry. The battery does make them more portable than the corded pole hedge trimmer but not as portable as the gas-powered ones because the battery tends to run out faster than a gas tank. The cordless pole hedge trimmer being electric creates less noise and pollution as compared to a gas-powered pole hedge trimmer. If you have lots of hedges that need trimming in your garden, you need to get yourself a hedge trimmer that saves time and effort. A pole hedge trimmer will be useful if the hedges are tall in your garden. You don’t want to be standing on a ladder trimming them as you risk falling and hurting yourself. If you have a small yard, you can consider buying a corded pole hedge trimmer that gives a limited range but is inexpensive and lightweight. If you want a bit more mobility, you can consider a cordless pole hedge trimmer that has a battery. It helps you move around the garden with ease trimming hedges. If you have a large garden with lots of hedges, you need to invest in a good gas-powered pole hedge trimmer because it gives you the mobility and power to trim for a long period of time before you need a refill of the gas tank. There are some factors that you should consider before making your buying decision about a pole hedge trimmer. The type of pole hedge trimmer you should choose depends on where and why you are going to use it. If you have a small garden with a limited number of hedges, you can consider buying a corded hedge trimmer. They are inexpensive and lightweight to use in such a garden as they are limited in mobility to the outdoor extension cord you use. If you have a bigger garden and want higher mobility, you should consider buying a battery-powered cordless pole hedge trimmer. They tend to be more expensive than a corded one but less than a gas-hedge trimmer while giving better mobility. If you have a very large garden with lots of hedges or you want to trim hedges commercially, you should invest in a gas-powered pole hedge trimmer that will give you the mobility and durability you need. They do tend to be a bit expensive and need more maintenance. The weight of the pole hedge trimmer plays an important part in your decision based on how much you want to use it. If you use it for the occasional trimming, you don’t need to be bothered as much about the weight. But if you’re going to use the pole hedge trimmer for long periods of time, the weight can quickly make you fatigued. Gas-powered pole hedge trimmers tend to be heavy because of the engine and gas tank. You can get battery-powered pole hedge trimmers that are moderate to lightweight and comfortable to carry around the garden for a long period of time. And the lightest are the corded pole hedge trimmers that make it a joy to use in the garden but they do limit mobility if you have a large garden. The power of the pole hedge trimmer is measured in cc, volts, or amps based on the type it belongs to. A gas-powered pole hedge trimmer comes with a 2-stroke engine whose power is measured in cc. You can get such a trimmer having a 21cc to 28cc engine. A cordless battery-powered pole hedge trimmer comes with a Lithium-Ion battery that can range from 18v to 56v. A corded pole hedge trimmer has power measured in amperes. You could get one that has a 3.3 amp to 4.5 amp motor. The handle of the cordless hedge trimmer should be comfortable to hold as you’re trimming the hedges in your garden. Try to get a hedge trimmer with a wrap-around handle as that gives the most comfort. You will also be able to use it to trim in hard to reach places of the hedges. If the handles can be rotated you could change the orientation of the blade so that it can trim horizontally or vertically based on the sides of the hedges you need to trim. Some handles also come with a protector that will keep your hands from touching the blade while in use. The cutting performance of the pole hedge trimmer also depends on the bar length and blades used. The length of the bar can vary from 16 inches to 24 inches and the longer the bar the more power it needs. If you have long hedges and lots of them you’re better off using a pole hedge trimmer with a long bar length. This will help you trim those hedges fast. If you have small hedges, you would do good to use a pole hedge trimmer with a shorter bar length so it will help you trim the hard to reach spots on the hedges. Try to get blades that are made of hardened steel so they provide high durability and performance. Having dual-action blades means you’ll get twice the trimming performance and reduced vibrations. The cutting capacity defines the thickness of the branch that the pole hedge trimmer can trim. This is based on the distance between the teeth of the hedge trimmer. You will find hedge trimmers than can trim from 3/8th to 3/4th of an inch. There could be some parts of the shrubs and hedges that the corded hedge trimmer might not be able to reach. In such situations, you need to keep a pair of pruning shears handy so you can trim such hard to reach branches. You want a pole hedge trimmer that can reach places on the hedges that are hard to reach. The handles that allow vertical and horizontal orientation work great as you can trim the sides and top of the hedge without straining your hands. A pole hedge trimmer also comes with several angular adjustments of the blade so you can trim the hard to reach places on tall hedges. The higher the quality of the pole hedge trimmer the better the performance and durability will be. Choose a hedge trimmer that comes with a good build and not cheap material. Ensure that the blades are made of high-quality hardened steel that are durable and does not need sharpening often. Battery-powered and corded pole hedge trimmers don’t need as much maintenance as a gas-powered hedge trimmer. With a gas hedge trimmer, you need to check that the gas tank, fuel lines, carburetor, and spark plug are of good quality so they last a long time before needing replacement. The longer the warranty on the pole hedge trimmer, the more assured you are of getting service in case something goes wrong during the warranty period. So choose a pole hedge trimmer that comes with a good enough warranty. The higher the quality and performance of the pole hedge trimmer, the higher will the price tend to get. We recommend selecting the best quality pole hedge trimmer even if it costs a bit more because it will be quite durable and perform well. If you just want to do the occasional trimming in your garden then you can settle for a budget variant that gets the job done. Do remember that gas-powered pole hedge trimmers will cost more than battery-powered ones. And battery-powered pole hedge trimmers will cost more than corded electric ones. So choose one based on your budget, power, and mobility requirements. The pole hedge trimmer is a sharp cutting tool that can be dangerous if you’re not careful with it. Remember to hold the shaft with both your hands when doing the trimming to avoid the risk of injury. Before using the pole hedge trimmer, make sure the work area is clear from debris so you don’t trip. Clear the work area of any children and pets that may be around. Protective equipment is a must before using any sharp cutting tool and the same goes for the pole hedge trimmer. Make sure to use a good pair of gloves that will protect your hands from cuts and flying debris. Use safety goggles to protect your eyes from the chips that may fly towards them. If you’re using a noisy hedge trimmer, you’ll need earmuffs to protect your ears from the noise. Wear a shirt with long sleeves and long pants when using the pole hedge trimmer. If you’re using a gas-powered pole hedge trimmer, make sure it has sufficient fuel. For a battery-powered pole hedge trimmer, make sure the battery is fully charged. And for a corded pole hedge trimmer, make sure you have the right outdoor extension cord available. Make sure the extension rod is attached or extended as much as you need to reach the top of the tall hedges. If there is a shoulder strap available, connect it so you can use the pole hedge trimmer comfortably without worrying about it getting too heavy to carry around. Position the front handle as far as you feel comfortable to hold the pole hedge trimmer. Set the tilt angle of the blade to the angle you feel sufficient to trim the top of the tall hedges. To start the electric hedge trimmer, push and hold the safety trigger, then push the on/off trigger and slowly release the safety trigger. To start the gas hedge trimmer you’ll need to push the choke a few times to let the fuel into the carburetor. Then you need to yank the cord to start the engine. Press the throttle to start up the cutting blades. To get the best cutting performance from the pole hedge trimmer, hold the blade at an angle of 15 degrees to the hedge. Cut the sides of the hedge in an arc motion starting from the bottom to the top. To cut the top of the hedges, keep the blade at a suitable tilt angle and then trim the top sweeping the trimmer from left to right. Ensure that the power is disconnected before you start working on the maintenance of the pole hedge trimmer. You can remove the debris from the teeth of the blade using a brush. Then clean all the areas of the trimmer using a damp cloth. The corded pole hedge trimmer does not need as much maintenance as a gas-powered pole hedge trimmer. You can use a clean cloth to do this and cover the blades with some orange oil or vinegar after the cleaning. Turn the hedge trimmer on for a few seconds so all the blade teeth are coated with the oil. For a gas-hedge trimmer, you need to take out the remaining fuel from the fuel tank. Then let it run for a while till the remaining fuel runs out. Once you’re done with the trimming work, store the pole hedge trimmer in a safe place away from children and pets. 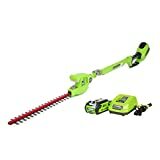 2-In-1 hedge trimmer and pole hedge trimmer; Max length of 8'8"
The Earthwise CVPH43018 is a corded pole hedge trimmer that has a powerful 4.5 Amp motor suitable for trimming hedges, shrubs, and bushes. The length of the blade is 18 inches and can trim branches up to 11/16 inches thick. The blade has a tilt angle that can be adjusted from -20 degrees to 60 degrees. The feature of this pole hedge trimmer is that it has a 2 in 1 functionality which means it can be used as a handheld hedge trimmer as well as a pole hedge trimmer. The maximum length of the aluminum pole can extend to 8 feet 8 inches and gives an overhead reach of 13 feet when you’re holding it in your hands. The weight of this pole hedge trimmer is about 9.7 pounds which is decent weight considering it is a pole trimmer. Because of it’s 2 in 1 feature, the weight is distributed at the end of the pole which makes it really heavy if you extend it fully. The Earthwise CVPH43018 pole hedge trimmer comes with a limited two-year warranty against manufacturing defects that may arise. The Greenworks 22272 is a cordless pole hedge trimmer that comes with a 2 Ah Lithium-Ion battery and runs on 40V. The 20-inch blade is made from steel which gives you durability and performance. It is a dual-action blade which means you get twice the cutting performance and reduced vibration. This pole hedge trimmer can cut branches up to 5/8 inches thick which should be sufficient to trim most hedges, shrubs, and branches. The blade can be adjusted to trim at multiple angles due to its 3 position pivoting head. The pole shaft can be extended up to 6 feet so you can trim the hedges that are tall and difficult to reach. You might find it awkward to use when the shaft is extended to its maximum length. The battery needs about 60 minutes to fully charge and the hedge trimmer can run up to 50 minutes before need a recharge again. The weight of the Greenworks 22272 pole hedge trimmer is about 9.6 pounds which makes it moderate weight for use in the garden. You may find that the quality of this pole hedge trimmer is not the best because of the thin plastic used and the nuts and bolts that are a bit flimsy. This hedge trimmer comes with a limited four-year warranty which covers defects in materials, parts, or workmanship. The Black+Decker LPHT120 pole hedge trimmer comes with a 20-V Lithium-Ion battery that is powerful enough for trimming hedges in the garden. You may find that the battery takes a few hours to charge which makes it slow. The 18-inch dual-action blades will help you trim the hedges with twice the cutting performance of regular blades while reducing the vibration by 40%. The blade can cut branches up to 7/16 inches thick. But it works well only for thin branches. The blade can be pivoted in five positions which makes it convenient to trim the hedge from the sides, top, front, and back with precision and ease. The shaft is made from rust-free fiberglass and can be extended up to 6 1/2 feet that give you an overhead reach of about 11 feet sufficient to reach those long hedges in the garden. There is a lock-off switch button that will protect you from any accidental starts. The weight of this pole hedge trimmer is about 10.2 pounds which makes it moderate weight to use in the garden. The Black+Decker LPHT120 comes with a limited two-year warranty that includes the tool, battery, and charger. The GARCARE pole hedge trimmer is an electric corded trimmer that comes with a 4.8 Amp powerful motor. The 20-inch laser cutting blade is made with rust-resistant hardened steel that makes it very durable and gives it high cutting performance. It can cut branches up to 3/4 inches thick. The head of this trimmer can pivot to six different positions which makes it easy to trim the hedge from a variety of angles. The shaft is made from lightweight and durable aluminum that can extend up to 9.2 feet giving you excellent reach for trimming tall hedges. It comes with a cord lock that will prevent the cord from accidentally disconnecting while you’re using the hedge trimmer. The GARCARE pole hedge trimmer weighs about 10.7 pounds which makes it quite heavy considering it’s a corded pole hedge trimmer. It comes with a strap to hold the trimmer while extended but it’s not the best quality. This pole hedge trimmer comes with a limited three-year warranty on the tool against manufacturing defects. 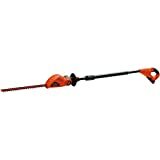 The Sun Joe SJH902E is a pole hedge trimmer that is corded and runs with a 4 Amp motor powerful enough to trim hedges, shrubs, and bushes in the garden. The 21-inch trimming blade is made from hardened steel to give good durability and performance. It’s a dual-action blade which means superior performance than a regular one as well as lower vibration while trimming. It can cut branches that are up to 0.7 inches thick. The telescoping pole can extend up to 7.9 feet and give you an overhead reach of 13 feet that makes it good to trim tall hedges. The multi-angle pivoting head helps to trim all sides of the hedges with ease. This pole hedge trimmer weighs just about 8.8 pounds which makes it moderate weight. This means you need to use it in short bursts while trimming hedges in the garden so you don’t tire yourself out. It’s also inexpensive and useful as a budget pole hedge trimmer if you just want one for the occasional trimming. If you have a lot of hedges to trim and a big garden, you might find the power is not adequate enough. The Sun Joe SJH902E pole hedge trimmer comes with a full two-year warranty on the tool in case of problems like manufacturing defects. No more do you need to spend hours in the garden trimming hedges with a garden shear. And no more do you need to worry about falling from a ladder while pruning those tall hedges. Get yourself one of our recommended pole hedge trimmers and you can get a well-maintained garden without the stress. In our opinion, the Earthwise CVPH43018 Corded Pole Hedge Trimmer is the best pole hedge trimmer you can buy based on the performance, durability, and 2-in-1 feature it provides. If you’re looking for an inexpensive pole hedge trimmer that gets the job done, you can consider the Sun Joe SJH902E Electric Pole Hedge Trimmer which gives value for money.